Today is shaping up to be just as boring as yesterday! No rain, again. I kinda miss it. Now I have to water flowers again. One of the carnations is already wilting. Grr. I watered around. I decided to move a bunch of flowers to more desolate patches, in hopes of repairing the disgusting dirt all over Shaolin. Hopefully it works, and will work quickly! 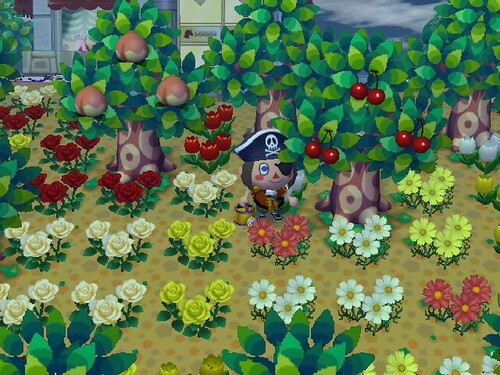 I miss my flower lined paths now, they look so naked… lol! Well, it’s Wednesday and you know what that means! City time! And what do I see when I first get off the bus, but my best buddy Phineas! Sweet. What should I get today? Ugh I got another PURPLE balloon. I want a freaking red one! 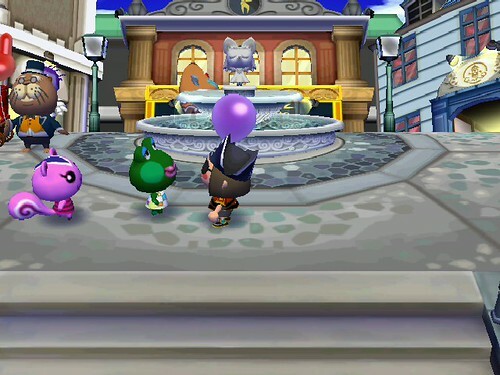 Interestingly, both Peanut and Jambette are in the city right now. Shaolin rejects reunite! UGH are you kidding? I just walked into Redd’s and the inventory is dismal. We’ve got a Black Knight (boring), a Moving Painting (prolly fake as usual) and a DESK LIGHT selling for 2,560 bells! Are you freaking kidding me? I bought the stupid painting and left feeling short-changed. I couldn’t resist so I went to Katrina’s to get my fortune told. I can see Pisces swimming lightly through an open expanse of deep, dark space… All the constellations gaze in awe at the sight of such graceful swimming… But remember… Even the most skilled swimmer may only swim where there is enough water. And so speak the stars… Fortune may favor you, or it may NOT… Something bad may be in your future, but it also may NOT be… Heed my words and just go about your normal business as usual… On this, the stars all agree. There is nothing in particular for you to worry about, so please be content. So… I got a ‘nothing’ fortune? Oh well, guess it’s better than getting a curse again! OMG! I went back to Shaolin and headed for Nook’s because I hadn’t checked out the stuff yet. 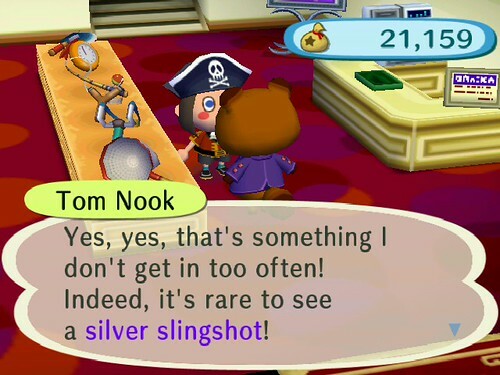 And I see something new – a Silver Slingshot! Sure, I don’t need it, but it’s just exciting b/c I haven’t seen any silver tools at all until today! Is this a promise of cool nets and fishing rods to come? Yes - a Silver Slingshot! 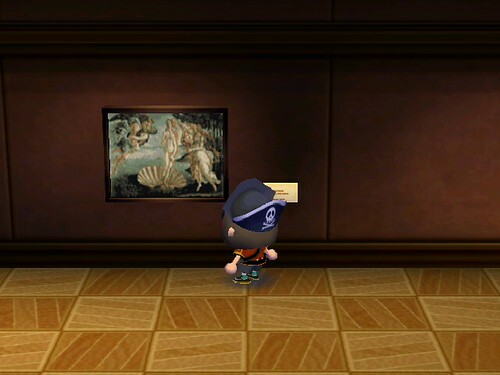 Whoa, I took the painting over to Blathers and it was legitimate! I ran off to the paintings section to see it on display. But it wasn’t in the main room. So I checked the back room, where I assume the REALLY good stuff gets displayed. And there it was, right next to the space where I’m assuming the Mona Lisa (aka Famous Painting) will be put up. Now that I look at it, I definitely recognize this ‘Moving Painting.’ I wish I could remember what it was called. But I know I’ve seen it in a real museum, probably either the Louvre, Musée D’Orsay or the Smithsonian or something. (Wow I feel lucky to have visited so many world famous museums lol!) Well, I guess that trip to Redd’s wasn’t a waste after all! The newest addition to the museum! This is probably more for my own purposes than anything else, but I’m going to attempt to do a time lapse series of photos to see how fast the grass grows back in a certain area. I’ll try to pose in the same place every time. I just want to see exactly how long it takes for this grass to grow in, now that it’s spring time. The moving painting is “The Birth of Venus” by Sandro Botticelli and it’s displayed in the Galleria degli Uffizi, Florence. The spreadsheet I use has all the info on the paintings, what they are and where they are. It’s really neat, but it was for WW and I had to add A LOT. Off to buy out Nook’s. Useless shopping point item here I come! Ahh, very interesting! I’ve never been to Italy so I guess I haven’t seen it in a museum. Maybe I got confused w/the image… that woman in the middle of the painting looks like a lot of the statues that were in Musée D’Orsay. Oh well, I tried! I know I’ve seen the Mona Lisa in person, at least lol!